Why Do Liberals Hate Success? Ding Dong, the Ding Dong’s Dead. At least he got the first sentence right…”Constitutional republic”…that we are. Aside from that, it really got me thinking…why do liberals hate success so much…but not celebrities? Every where you turn, there is a shaming for success. Liberals hate pretty much all wealthy white men. They are blamed for most of the issues concerning American right now. They have stigmatized the “1%” because they have worked hard…and often times play hard. But why the disconnect? Somewhere, someone, decided that it’s not okay to be successful. Someone decided that it’s wrong for a CEO to make more money than a blue collar worker. 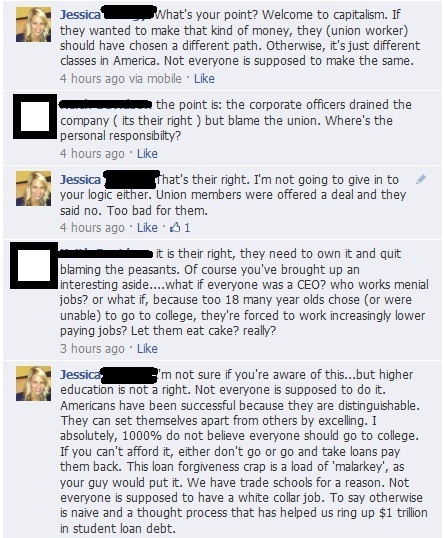 Someone decided that we need unions to constantly challenge executives because they earn more. Someone decided that it’s not okay to have more money than someone else …but ONLY on the basis that they also don’t have that same large amount of money. And what’s more interesting is that they don’t want to be equal on a high earning scale, they want everyone to be equal on a low-earning scale. They want upper middle class and upper class people to be yanked down to their level. But why are liberals so angry? It can’t be because conservatives don’t share their earnings. They do. It’s called a donation. (Here is the definition, since many liberals don’t understand the difference between a tax and a donation) There have been several articles describing the charitable giving on behalf of conservatives and it’s a known fact that liberals prefer the oh-so-trustworthy, ever-so great-at-handling-cash government to redistribute funds as opposed to nonprofits. In fact, research says wealthy AND red states are much more likely to donate to charity. Even the Huffington Post tried to twist conservative giving by unsuccessfully trying to claim that donations to churches don’t count. So what of it? If they’re sharing –just not with the government- why do liberals hate success? And why do they give a pass to the entertainment industry? Not to mention the plethora of celebrities that endorsed the Democrat platform during the last election: 50 Cent, Lady Gaga, Ellen Degeneres, Will Ferrell, Brad Pitt, Vanessa Williams, Reese Witherspoon, Bill Cosby…here is the list of HUNDREDS of them. Someone, please tell me why. Why are liberals shaming success? And why are they so forgetful of all the ‘success’ on their side when they’re criticizing and degrading successful conservatives? Who do they think is paying for all their dependency and entitlement programs? Why is it okay for Bill Cosby to rake in millions but not a CEO? This entry was posted in Media, National and tagged Bill Flanagan, CBS Sunday Morning, government bail out, Hostess, liberals hate success, taxes vs. donations on November 18, 2012 by Jessica Szilagyi. Not correct…… they like liberal white rich men. They claim they hate wealthy men who “buy” elections, they hate the Koch brothers…… but they love George Soros, a liberal white rich man. Harry Reid complains about billionaire’s using their money to effect the outcome of elections, but he has no problem with Thomas Steyer, a billionaire who donated huge sums of money to Democrats. Democrats have no problem with wealthy white men buying elections, as long as they are buying the election for a Democrat.